Only now in Fort Bragg, California at mile 62 and change do I check the time: 2:47 pm. I've been afraid to look. The winter sun filters through a thin cloud layer and the shadows of the town buildings are downright chilly. 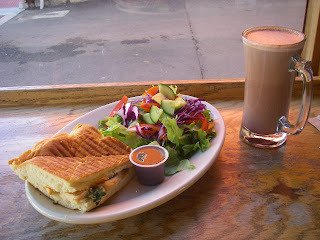 I've found Headlands Coffeehouse, the one place serving food in the middle of a Sunday afternoon in winter. That's the good news. Refueling and enjoying the photos of latte art, courtesy of a barista. The bad news? A sign back there on the road says 45 miles to Point Arena. Point Arena is just not happening. Not today. Today is a hybrid day, a quilt of no fewer than 4 different riding experiences. First, about 20 miles on 101, half of them on dicey two-lane, no shoulder. Share the road. Make it to Leggett in one piece. Then, 22 miles of the far northern reach of Highway 1, the famous part that goes from 101 to the ocean around the Lost Coast. Survive the climbs (3.5 and 2 miles) and the descent (10 miles, moss on the road). Avoid mechanical issues. You basically climb and descend a big ridge and then a smaller one. On this stretch when you look around all that's visible is dense vegetation. Many shades of dark green, no views. It's too dark for photographs. And on the downhill, too risky. My mom took the 1959 Mercury wagon for a spin here, too. She lived to tell about the experience (but didn't repeat it). The curves are legion and steep but as long as I'm paying attention, no problem on a bike. Moss and rust adorn the few human artifacts out here. Now and then a brave or arrogant soul ventured to build a cluster of summer cabins, on a flat spot. The structures are in varying stages of being devoured by nature. Then, voila! The ocean and its sweeping horizon. Everything suddenly bright and wide, as if the world has been cracked open. I stop for a moment to take in the riches on display. Light, sky, water, rocks. Soft, irregular contours of the high cliffs, dotted with tufts of pampas grass. Unstable ground, the reason the road turns abruptly away from the coast at this point and does not return for a hundred miles. A message spelled out on the beach in driftwood: What's Up/A Trip North! The position of the sun. Late. I skedaddle southward with a tailwind, past the mileage sign for Fort Bragg and Point Arena. 20 miles of rolling terrain, with many steep descents and climbs where creeks meet the ocean. Over and over, porpoise-ing the hills with some urgency. To the coffeehouse, where there is cell reception. I'm able to check in with Danny, who is already home. The goal for this trip is a hundred miles a day, give or take. That's also about what daylight and my current training allow. Mendocino is too close (and too precious) but a little town named Elk sits at about the right spot. I ask Danny to check online and see if a bed and food can be had there tonight. "No Vacancy" signs would be normal after the busy Thanksgiving weekend. Heck, every business in Fort Bragg seems to be shut and Fort Bragg is a big town. He finds me a cottage at the Griffin House Inn, with a pub restaurant that opens at 5. On my way. With a goal and a full belly it's possible to motor 32 miles in remaining daylight. The terrain is gentle, easier than I remember. Only the Navarro River requires descending down to sea level, then climbing back up to the bluff. Lights on for the last 10 minutes. The inn and pub are an unbelievable gift, the only services open in Elk tonight. Walking into the pub, the owner Carol lifts her head and says "you must be Elaine". Porpoising? You leapt off of the bike at the top of each hill? I'm glad of the help, the pub, the place to stay - and I like that you found something to be grateful for each day of the trip back. :) Love the last photo.